Urbana’s Kris Hamilton competes in the 110-meter hurdles at the Division II state track and field championships on Friday. Hamilton was disqualified from the event and failed to advance to the finals in the 300-meter hurdles. 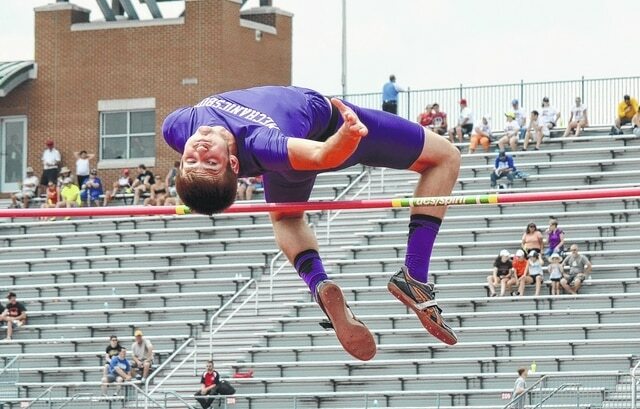 Mechanicsburg’s David Harvey leaps over the bar during the Division III high jump competition on Friday. Harvey cleared 6-04 and finished 8th. COLUMBUS – A handful of Champaign County athletes were in action at the state track and field championships on Friday. In Division III, Mechanicsburg’s David Harvey took 8th place in the high jump final, clearing 6-04. In the long jump final, Harvey finished 11th (20-08.75). Also going final on Friday, Mechanicsburg’s Phil Cook was 13th in the pole vault (12-06). Also in D-III, West Liberty-Salem’s Morgan Freyhof qualified for Saturday’s finals in the 100-meter dash, finishing 8th in 12.64. Freyhof failed to qualify in the 200-meter, finishing 12th in 26.42. Kam Evans won his heat in the 300-meter hurdles and was placed next to fast qualifier Chad Zallow for Saturday’s finals, exactly where he wanted to be. Evans’ time is 4th overall going into Saturday’s final, which will start at 10:40 a.m.
“Kam did exactly what he needed to do to set himself up for a run at one of the top spots on the podium on Saturday morning. I’m excited for Kam that he gets to end his WL-S career in the state final with a chance to place again at the state meet,” said WL-S Coach Joe Taylor. In Division II, Urbana’s Kris Hamilton was disqualified from the 110-meter hurdles and finished 15th in the 300-meter hurdles. In 8U softball, Bet-R-Buy Auto Sales defeated Perpetual, 18-17. Outstanding players for Bet-R-Buy were Kiley Ullery and Corynn Ryan who knocked in the winning run. Outstanding players for Perpetual were Olivia Deere and Lola Rice.